Every year March is an important month for both Irish and global Anti-Racism Movements due to various international celebrations focusing on combating racism and celebrating diversity taking place. 21 st March marks an important day in every anti racist’s calendar. On that day in 1960, police opened fire and killed 69 black people at a peaceful demonstration for equality and against apartheid laws in Sharpeville, South Africa. This date has since been declared the International Day for the Elimination of Racial Discrimination, when the people across the globe show their opposition to racism and solidarity with those affected by it and in remembrance of the harmful impact of racism on individuals and communities. Additionally, the week of 18-26 March is the European Week Against Racism and the week following 21st March marks the UN Week of Solidarity with the People Struggling against Racism and Racial Discrimination. During those weeks thousands of people, not just in Ireland but all across the EU will come together to promote and celebrate equal rights and diversity in Europe. 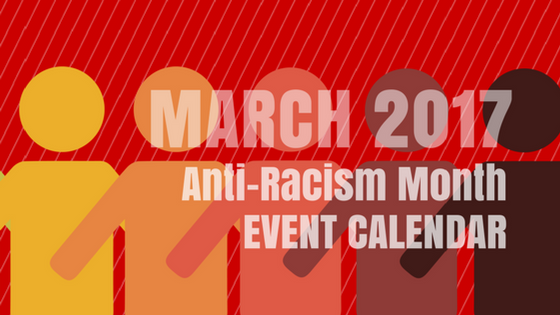 ENAR Ireland and our Network’s Members will coordinate and celebrate not only that important dates, but the entire month full of anti-racism and intercultural events between 1st and 30th of March with one additional event on 4th of April. Check out what’s happening in your area in the below Events Calendar and join the event near you. If you wish to add your event contact Aga at aga@enarireland.org. Wedns, 1st March, 10am, Dublin – Mobilising Communities Against Racism in Housing Workshop. Fri, 3rd March, Castlebar, Co Mayo - Join Dance for Syria fundraiser to raise money for Syria! There’ll be a raffle on the night for individual exclusive pieces of art, donated by local artists & craft-workers. Mon, 6th March, 6pm, Dublin - Join Amnesty International at the Europe: Let’s Bring Them Here Rally, part of a series of regional actions to remind European leaders of their promises to refugees. Thurs, 9th March, 10am, Dublin - RACISM AND THE MEDIA WORKSHOP PART 1: Taking a complaint about print media. Part 2 will be on 4th of April. (Priority will be given to ENAR Ireland Network Members). Mon, 13th March, 7:30pm, Cork - Syrian Irish Culture Night for Safe Passage - Safe Passage volunteers are hosting a Syrian Irish Culture Night in Nasc Ireland. Join them to share traditional music, culture and food! Tues, 14th March, 10am, Dublin - CDETB Separated Children’s Service is launching a new video resource: 110% – the experience of young people from migrant backgrounds in and around employment. The video resource is aimed at professionals working with young people in the youth and education sector. Highlighting issues faced by young people from minority ethnic and migrant backgrounds it intends to stimulate and facilitate discussion and reflection. Thurs, 16th March, 6:30 pm, Dublin - Undocumented in Ireland and the US. Join members of the Justice for the Undocumented campaign for a candlelit rally to send our solidarity and support to undocumented people in the US. Help light up our St Patrick’s Day shamrock and send a much-needed message of hope to undocumented migrants on both sides of the Atlantic. Sat, 18th March, Dublin – Annual Multi-Cultural Day in the Islamic Cultural Centre Ireland. Expect fun & games for children, face-painting, balloon modelling, BBQ, bazaar, football tournament with civil servants and NGOs, table tennis tournament, henna body art, story telling, and much more! 18-26th March, Dublin – To mark European Week against Racism the Social Inclusion Unit, South Dublin County Council is hosting a competition which aims to combat racism and to celebrate culture diversity of people living in Ireland today. The competition is open to everyone living in South Dublin County. Sun, 19th March, 11am, Waterford & across Ireland - An invitation is going out from the Joy Bells of Waterford to all churches with bells in Ireland, to young and old, wherever people gather publicly, to ring out the bells in a protest against racism and anti-immigrant sentiments on March 19th. Please pass on this message to a church near you. 20 – 24th March, Dun Laoghaire – 7 Continents One Lunch - Awareness raising event with food provided from the 7 continents of the world. Colleagues are invited to place small photo of a loved one on the globe – hopefully demonstrating that we are all united. Nationwide – ENAR Ireland launches its newest iReport.ie Report of Racism in Ireland July-December 2016. Dublin, 1pm – Join Protest against the European Court of Justice Workplace Hijab Ban organised by Muslim Sisters of Eire with support of ENAR Ireland. Show solidarity with Muslim women and their right to choose. The issue needs to be highlighted to prevent further alienation of Muslim women and to ensure safe and unbiased workplaces across Europe. Dublin, 5:30pm – Support MASI, Challlenge the International Protection Act as they are making a presentation on the International Protection Act (IPA) to members of the Dáil this Tuesday. Come in solidarity! Galway, 7pm – The Reality for Travellers: Accommodation Needs in Galway. The Galway Traveller Movement and the Galway Anti Racism Network are holding a public meeting to discuss Traveller accommodation needs and human rights in Galway, as part of European Week Against Racism. All Traveller families are encouraged to attend to share their accommodation stories in a welcome space. Wedns, 22nd March, Dublin – Hate Crime Bill is getting a mention at the Oireachtas Justice Committee. Thurs, 23rd March, 11am, Dublin – ENAR Ireland and National Committee Against Hate Crime are presenting on hate crime to cross-party group of TD’s & Senators. Thurs, 23rd March, 6pm, Trim - Trim Family Resource Centre will host a “Human Library” which will bring together people who may not usually get the chance to have a conversation: it increases understanding between people and challenges prejudice and stereotypes. Do you have a story to tell? This interactive community event will take place in Trim Library from 6pm to 8pm on 23rd March to mark International Week Against Racism! Fri, 24th March, 2pm, Navan, Co Meath - United Meath Anti-Racism Day Event - This is an inter-agency event co-ordinated by Cultúr Migrant Centre which will be held in Claremont Stadium from 2pm to 6pm with a broad range of workshops, family and child friendly fun activities, food and information. Kells People’s Resource Centre will have an information stand and will conduct an “Equality Workshop”. Fri, 24 March, 8pm, Kells, Co Meath - Celebration of Cultural Diversity in Kells - Kells People’s Resource Centre will host an information/celebration evening from 8pm to present the findings of a recent Migrant Survey which highlights the experiences of migrants in our community and how we as a community can be more inclusive. We will have guest speakers and share experiences and ideas while enjoying an array of international food. All welcome! Wedns, 29th March, 10:30am, Dublin - Amal Women’s Association and IFI women’s group will host a reception to mark International Women’s Day. Thurs, 30th March, 10am, Dublin- End of Direct Provision to be debated in the Daíl. There will be a debate in the Daíl on Direct Provision, on Thursday. United Against Racism invites everyone to join a rally at the gates of the Daíl. Friday 31st March, nationwide - the deadline for entries for Show Racism the Red Card Creative Competition. Fri, 31st March, 9:30am, Dublin - Discussing the merits of proposing a new National Action Plan on Racism and Interculturalism (NAPAR). A national seminar with Anastasia Crickley, President UN CERD, Jamie Schaerer E.N.A.R. and other members of ENAR Europe Board. Sat, 1st April, 1pm, Dublin – UCD Islamic Society invites you to Anti-Islamophobia Day to raise awareness about this issue and create a sense of unity among the Irish community during these divisive times. Tues, 4th April, 2pm, Dublin – RACISM AND THE MEDIA WORKSHOP PART 2: Complaints to the Broadcasting Authority of Ireland and strategising about press and broadcast interventions. Part 1 will be on 9th of March. (Priority will be given to ENAR Ireland Network Members). Do you have an anti-racism or intercultural event coming up in March? Let us know by emailing aga@enarireland.org to have this event included in our Event Calendar.